Starting a freelance business? You need these three marketing items to promote your business, connect potential clients, and position yourself as an expert. When you hand a client, prospect, or potential strategic partner a business card, brochure, rack card, note card, or other print marketing piece, you are placing your brand in their hands. Print marketing materials provide an opportunity to make an impression through touch that isn’t possible when connecting online. You only have one opportunity to make a first impression, which means you can’t risk making a bad impression by handing someone unprofessional marketing piece, confusing them with items that look like they are from different companies, or sending them to a website that fails to represent your skill, knowledge, and professionalism. Every piece of branded marketing material, whether it is online or offline, should represent your brand, your promise, and your value authentically and consistently. Together, a cohesive marketing strategy and strong visual brand will not only help you communicate feelings of stability, credibility, and dependability but help the recipient decide whether they are going to save your sales piece, or throw it away. From brochures, rack cards, booklets, stickers, letterhead, postcards, business cards, and note cards to social media accounts, websites, blogs, sales pages, digital ads, email newsletters, and more, you have a lot of options to choose from when it comes to creating marketing materials for your new business. But you don’t need them all. Often, your business card is the first thing a new prospect will see. It is a representation of your brand and a primary way to provide others your contact information. Your business card must communicate who you are and what you do, and it need to capture their attention and make them want to learn more. If you start a business, you must have a website. A professional, easy to navigate website gives you an online presence, adds credibility, helps your audience get to know you, and instantly elevates your level of professionalism. When combined with a blog, your website is also a powerful marketing tool for your business that can be used to educate your audience and position yourself as an authority in your industry and niche. Use a content management system like WordPress when creating your site so you can easily update the content, publish new content, and maintain the site. The website design must represent your brand, reinforce your message, and support your brand positioning. Remember, the design should support the content and your offers. The site should be easy to use, allowing visitors to quickly find the information they need. The website content should be written at sixth to eighth grade level, making it clear and easy to understand and avoiding too much technical jargon. All images and media need to be optimized so the pages and posts load quickly. Invest time in keyword research and search engine optimization so you can maximize the ROI on your site and blog posts by being found online more often. To further build your brand and connect with clients and prospects, you also need a follow up marketing piece. While this could be a brochure, a rack card, or a postcard, I have found that a branded note card delivers the most bang for your buck — and when starting a freelance business, every dollar counts. With a branded note card, you can easily follow up with new contacts, prospects, and potential partners with a handwritten follow up note after a networking event, conference, or meeting. With quick online communications and email dominating business communications, sending a handwritten note and dropping it in the mail is an easy way to stand out from the competition. Quality matters. Invest in quality printing and great paper so your brand feels good in the recipient’s hands. Design matters. The note card needs to look and feel like your brand, which means the design must visually match your website, business card, and even your social media profiles and pages. Include your contact information. On the back of the note card, include your full contact information. Often people lose your business card or give it to a friend when making a referral, but they’ll save a handwritten note. By including your contact information on the note card, they’ll always have it. Remember to use the note cards! Don’t order them, put them on a shelf, and forget about them. Bring a stack (and stamps) to the next conference you attend, write your follow up notes in your hotel room, and mail them from the hotel. Don’t have a physical mailing address and can’t use a note card to follow up? No problem. If you don’t have a mailing address, it’s okay to follow up by email. When following up by email, it’s important to mimic the personal feelings a handwritten note creates and make it obvious you’re not simply plugging their name into a canned email template. 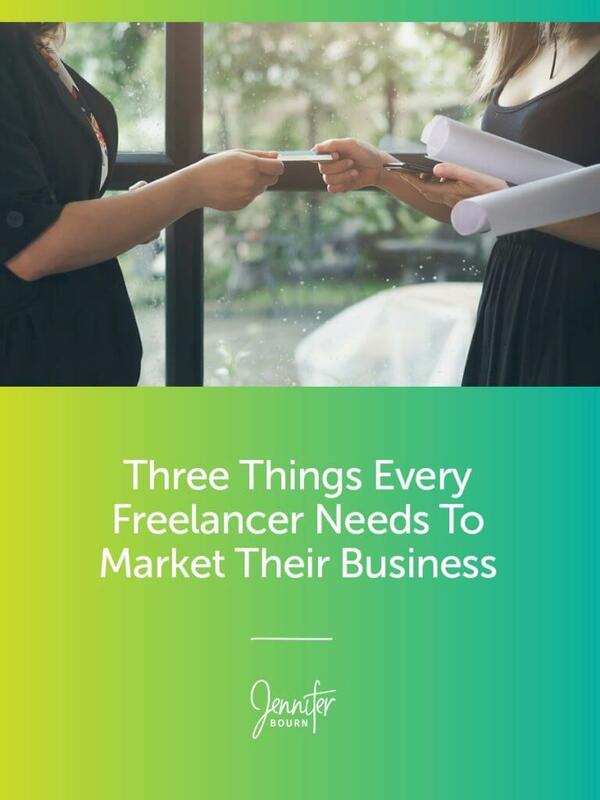 When used separately, a business card, website, and note card work well to connect your freelance business with your audience, but when used together, they are a powerhouse trio that demonstrates your professionalism, expertise, credibility, and stability. When you hand someone your business card, they go check out your website, and then they receive a note card that ties their entire brand experience together, it elevates your freelance business and your own reputation.